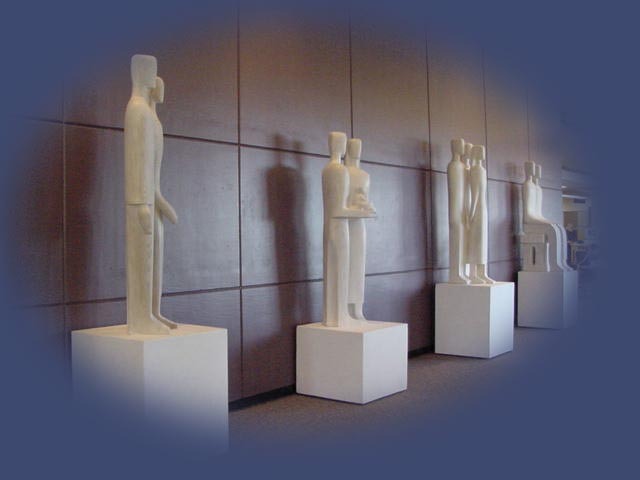 These sculptures can be found on the 2nd floor. HSU Library is proud to host the Bruno Groth Virtual Art Gallery, a website that chronicles the life and art of Bruno Groth. Bruno Groth was born in 1905 in Stolp, Germany and immigrated to the United States in 1923. Groth lived the majority of his life here in Humboldt County. His wife Nita, son David and daughter Nina live in the area and are also artists. Bruno Groth's work has been shown at the Brussels World Fair in 1957, and in such places as New York, Los Angeles, and San Francisco. Much of his work was inspired by nature, life and death. Humboldt State University is fortunate to own a spectacular collection of statues by Bruno Groth, a local artist of national acclaim, but whose work can be found in many local and national collections. Bruno is no longer living, though his legacy lives on through his art. The Unfoldment has undergone some damage throughout the years, and was recently restored by a local sculptor, Jack Sewell. The HSU Library is proud to display this collection.